The annual Perseid meteor shower will peak on the new moon weekend of Aug. 11-13, 2018, giving observers worldwide the chance to see one of the best astronomical events of the year. Mobile apps can help you see these particles burning up, often as fireballs (inset), in Earth's atmosphere. When the radiant position is low, many meteors will be blocked from view by the Earth, so the absolute best time to view Perseids is from a dark sky location around 4 a.m. local time, when the radiant is close to the zenith. This weekend brings us one of 2018's best astronomical events: the Perseid meteor shower. 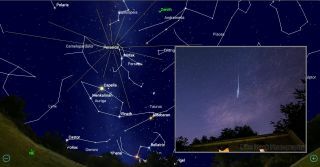 The Perseids are one of the most rewarding showers of the year, frequently delivering bright fireballs exhibiting long, persistent trails. While the shower recurs every year around this time, moonlight can spoil the fun. But for 2018, the moon will be in its new phase during the peak of the shower — leaving our night skies dark for meteor-seeking skywatchers. And ad bonus is that the peak occurs on a warm summer weekend! Many people use the phrase "shooting star" to describe a meteor, but that's misleading. Meteors are happening right here at home, above Earth's surface, and are independent of the distant background stars. The light we see streaking across the sky is occurring within Earth's atmosphere. Meteor showers occur when Earth's orbit carries us through zones of debris left in interplanetary space by periodic comets (and, in some cases, asteroids). Over centuries, the pparticles, which weigh about 1 to 2 grams and range in size from sand grains to small pebbles, accumulate and spread out into an elongated "cloud" along the comet's orbit. (A good analogy is the material tossed out of a dump truck as it rattles along. The roadway gets quite dirty if the truck drives the same route many times!) If Earth's orbit intersects the comet's orbit, we experience a meteor shower that repeats annually because Earth returns to the same location in space on the same dates every year. The Meteorshowers.org website offers an interactive 3D tool that lets you manipulate a model of the solar system and the comet debris zone that produces each meteor shower, as shown here for the Perseids on Aug. 12, 2018. Earth is the small blue dot that is passing through the debris. As we traverse the debris, our planet's gravity attracts the particles, and they burn up as "shooting stars" while falling through Earth's atmosphere. The particles enter the atmosphere at speeds ranging from 25,000 to 160,000 mph (40,000 to 256,000 km/h). And each particle's kinetic energy hionizes the air molecules it encounters, leaving a long trail of glowing gas that is less than a few feet wide, but many miles long. Most trails occur in the thermosphere, the region of the atmosphere about 50 to 75 miles (80 and 120 km) above the ground. Slower meteors need to reach the denser atmosphere at lower altitudes before forming a trail. Viewed from the Earth's surface on a clear, dark night, we see the trails glowing briefly as they streak in front of distant stars. The colors that meteor watchers see come from a combination of factors. Red light is emitted by the glowing air molecules. The meteor itself is also burning up during its high-speed passage, and oranges, yellows, blues, greens and violets are produced when minerals in the particles — such as sodium, iron and magnesium — are vaporized. Scientists can analyze the color spectrum in a meteor trail and determine the particle's composition. If anything survives to land on the ground, it becomes a meteorite. An easy way to remember the difference is to recall that many rock names end with "-ite," like granite. The duration of a meteor shower depends on the width of the debris zone — that is, how many days or hours it takes Earth to pass through it. A meteor shower commences on the date when the Earth first enters the debris zone. The shower then builds to a peak when Earth passes through the densest portion of the cloud, and then tapers off, ending on the date when the planet exits the zone. The number of meteors produced during a shower depends on whether Earth passes through the densest region of the zone, or merely skirts the edges. Since that debris is also orbiting the sun, the density of the particles varies on a time scale that is related to the source comet's orbital period and shaped by the pull of other planets; producing years when more, or less, material is encountered. Planetary scientists create models of the debris distribution to help predict the intensity of showers each year. Apps designed for observing meteor showers take those variations into account. To make this image taken on Aug. 12, 2013, Markus Lu combined multiple exposures from his tripod-mounted DSLR camera. It captures multiple green-hued Perseid meteors radiating from northern Perseus. The bright clump of stars on the far right is the Pleiades star cluster in Taurus. The glow of distant city lights illuminates the northern horizon. Several factors affect how many meteors you will see during a shower. If Earth happens to traverse the densest part of the cloud while it's daytime, you'll be looking for meteors the night before or after the peak, somewhat reducing the numbers. Because most meteors are dim, a dark sky is essential to see them. Unfortunately, the moon can ruin an otherwise terrific show. The new-moon phase, when the moon is near the sun, will leave the night sky dark. First-quarter moons set in early evening, and last-quarter moons don't rise until the wee hours, so meteor hunters can work around them. Full moons stay up all night and can spoil a shower. Thankfully, phases of the moon vary year from year, so every shower gets good years and bad. (Last year, the moon was just past full on the Perseids' peak night.) Your astronomy app will tell you the phase of the moon at the peak of a meteor shower. Look at all the dates around the peak to find nights when the moon is less of a factor. The source of the Perseid meteor shower is a 133-year periodic comet named Comet 109P/Swift-Tuttle. You can use the SkySafari app to see the comet's orbit rendered in 3D. Select the sun and tap the Orbit icon. The app will display a 3D model of the solar system. If the planets' orbits are not plotted, enable them in the Settings / Solar System menu. In the same menu, enable the Selected Object Orbit option. Now use the search menu and type "109P." When that comet's information screen appears, tap the Center icon. You can enlarge and rotate the view to see how the comet passes through the inner solar system and adjust the years to watch how the comet moves over time. Each meteor shower is named for the constellation Earth is heading towards as we pass through the debris field, causing the meteors to appear to radiate from that patch of sky. Astronomy apps like The SkySafari 6 can display the radiant for the meteor shower against the distant background stars. The radiant for the Perseids is in the upper region of Perseus, below the bright "W"-shaped stars of Cassiopeia and above the bright star Mirfak. But focus your attention on the rest of the sky; any meteors seen near the radiant will have shorter trails. The highest number of Perseid meteors is expected from Sunday night through Monday morning (Aug. 12 to 13), when Earth will be closest to the core of the debris zone. The active period for this shower runs from July 13 through Aug. 26, so keep an eye out for Perseids before and after this peak weekend, too. This shower is known for producing 60 to 80 meteors per hour, or more, at the peak — many manifesting as bright, sputtering fireballs with long, persistent trails. Watch for trails that linger for a few minutes while dissipating, like jet contrails! The Perseid shower's radiant lies between the constellations Camelopardalis the giraffe and Perseus the hero, but the meteors can streak across any part of the sky. The radiant is low in the northeastern sky during mid-August evenings, and nearly overhead by dawn. Meteor showers are best observed in the dark skies before dawn because that's when the sky overhead is leading the Earth as it plows directly into the oncoming debris field, like a moving car's windshield getting splattered with bugsd. And when the radiant is overhead, around 4 a.m. local time, the entire sky is available for meteors that are no longer hidden from view by Earth's horizon. When observing a meteor shower, don't focus your attention on the radiant. Meteors from that location will be heading directly toward you and will have very short trails. For best results, try to find a safe and dark viewing location with as much open sky as possible. Even a 30-minute drive to a park or a rural site away from ncity lights will help a lot. You can start watching as soon as it is dark to catch the very long meteors that are produced by particles skimming the Earth's upper atmosphere. These are rarer, but they feature longer trains. The source material for the Perseid meteor shower is thought to be the periodic comet 109P/Swift-Tuttle, named for the two astronomers who independently discovered it in July 1862. The tilt of its 133-year orbit (white line) is roughly at right angles to the plane of our solar system. The comet continuously shuttles between a perihelion distance just outside Earth's orbit and aphelion beyond the orbit of Pluto (purple line). You can recreate these interactive 3D views in SkySafari by selecting the sun and tapping the Orbit icon, and then searching for and centering the comet. Bring a blanket for warmth and a chaise lounge (or something similar) to avoid neck strain, plus snacks and drinks. Try to keep watching the sky even when chatting with friends or family — they'll understand. And call out when you see a meteor; a bit of friendly competition is fun! If folks nearby don't mind, use your mobile device to add a musical accompaniment. Meteor showers are a screen-free activity. But before you put your phone away, use the SkySafari app to find out where the radiant is. Use the list of Meteor Showers in the Search menu or type the name "Perseid" into the search bar. On the shower's information screen, tap the Center icon and then enable the app's Compass mode (in the toolbar). Then hold your device up and pan around until you find the constellation Perseus. The distinctive "W" of Cassiopeia will be above it. Once you are ready to look for meteors, try to avoid looking at your phone or tablet — the bright screen will spoil your adaptation to the dark. If you must look, minimize the brightness or cover the screen with red film. Disabling app notifications will also reduce the chances of unexpected bright light. And remember that binoculars and telescopes will not help you see meteors because they have fields of view that are too narrow. Meteor showers are excellent opportunities to take wide-field, long-exposure images of the sky. Mount your camera on a tripod and take a series of exposures a few tens of seconds long. Or use a simple equatorial tracking mount to avoid star trails. See NASA's tips for photographing a meteor shower for more information. SkySafari 6 and similar sky-charting apps will allow you to search for other meteor showers by name and will display their radiant location on the sky. The app will provide information about the source comet or asteroid; the start, end and peak dates; and some history. You can adjust the app's time to visualize when the radiant will be above the horizon for your location. If you snap an awesome photo of Perseid meteors that you'd like to share with Space.com and our news partners for a potential story or gallery, send images and comments to spacephotos@space.com.